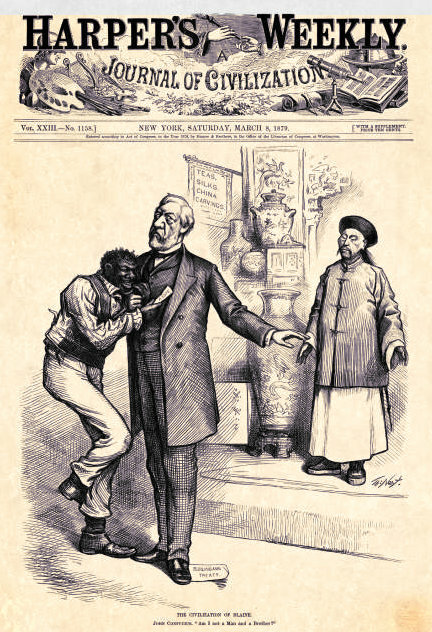 The Chinese Exclusion Act was the first federal legislation which denied entry of an immigrant or groups of immigrants to the United States, based on their country of origin and or race, in this case, Chinese. 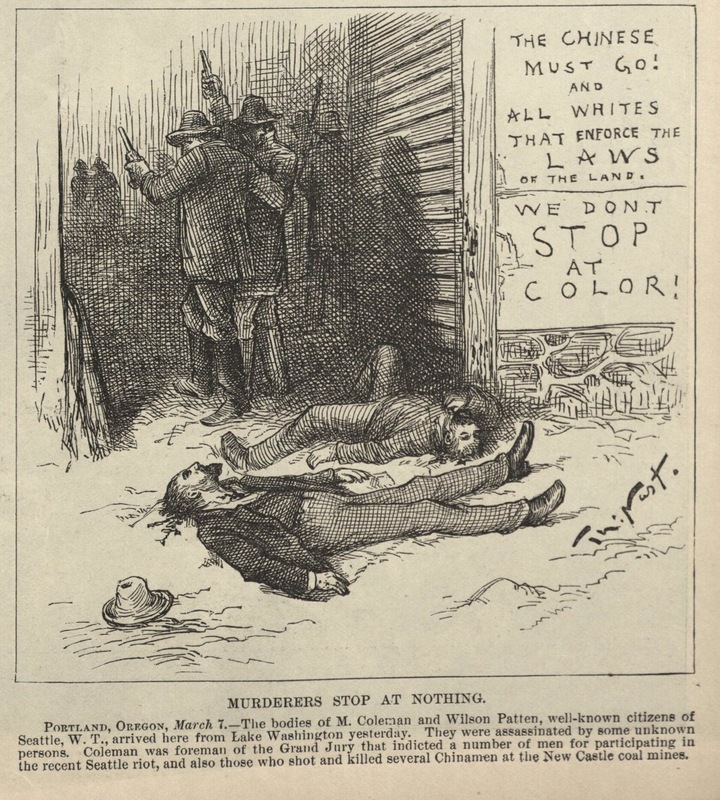 In this issue, which also includes another example from Nast on Chinese immigration policy, two murdered white men lie on the streets of Seattle, Washington, then a U.S. territory. The cartoon depicts an actual news event. The perpetrators of the double-murders lurk in a darkened alley, their identity unknown. The victims, identified as M. Coleman and Wilson Patten, “well-known” citizens of Seattle, killed for serving on a Grand Jury which indited several men for participating in an anti-Chinese riot. As the caption states, several Chinese men were killed in labor dispute in nearby coal mines. Similar riots and melees were sprouting all across the pacific Northwest. Labor issues at coal mines were a frequent backdrop for white versus Chinese intimidation and violence. The Pacific Reporter, Volume 19, “containing all the decisions of the supreme courts” for western territories states provides additional details. 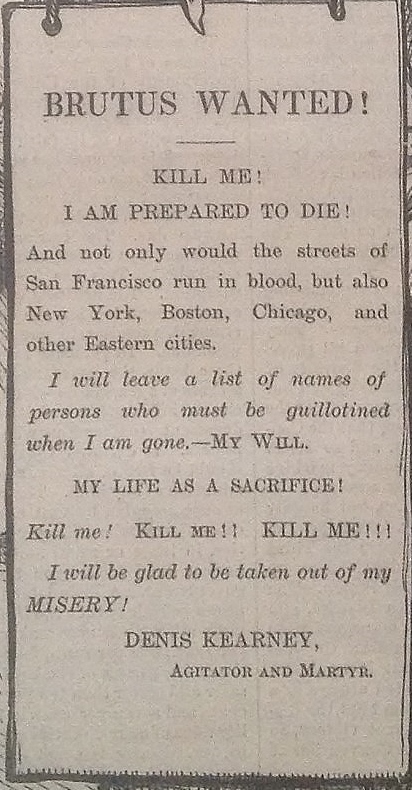 Subsequently one George H. Miller, described in the transcript as “ignorant and illiterate” was indicted for murder. Miller’s motive, allegedly, was to stop the testimony of Coleman and Patten who would implicate him in some manner. A Chinese conflict is not addressed in the court documents. The evidence against Miller was circumstantial. Miller was found guilty and sentenced to hang. “The murder was the shooting of one George M. Coleman and a 16-year-old school-boy by the name of Patten” (50). The law of the land is not to be respected. 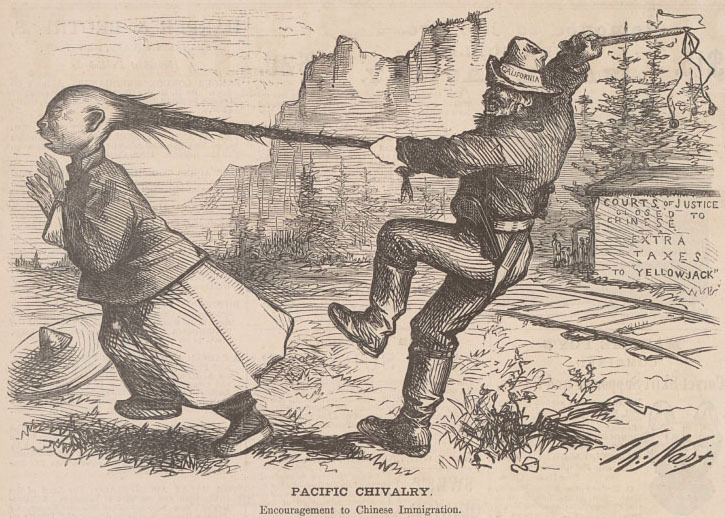 The Chinese allowed to stay under the provisions of the Chinese Exclusion Act, must also go. The example of this double-homicide by anti-Chinese vigilantes makes their intimidating message very clear. “It is a national disgrace that having excluded Chinese immigration by law, the hundred thousand Chinese who are so unlucky as to be caught in the country are outraged by foreign mobs, while the government politely regrets that it can do nothing,” Harper’s editor writes. Curiously, Harper’s summarizes with mixed messages, “The coming of the Chinese may be a curse. But if it be a curse, it is now prohibited by law, and honest Americans upon the Pacific slope should be the first to defend those who are here against brutal lawlessness” (p,195). 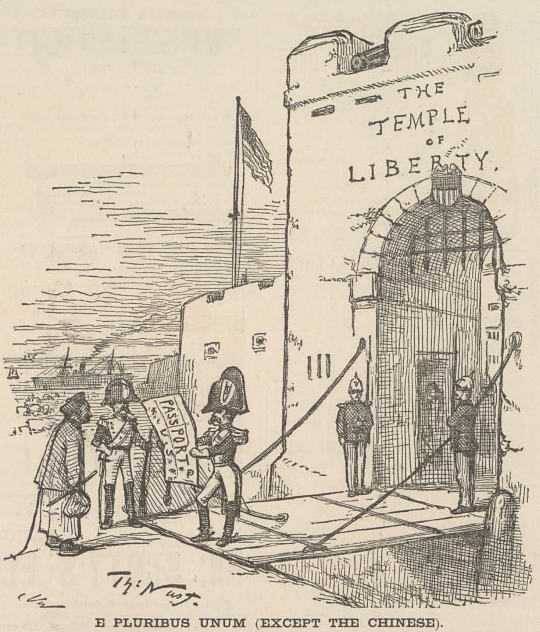 Donald Trump is not the first presidential candidate to call for the outright exclusion of a group of people, based on ethnicity or religion, from entering the United States as a visitor, or as an immigrant with aspirations for citizenship. That notoriety goes to James G. Blaine, the U.S. Senator from Maine. 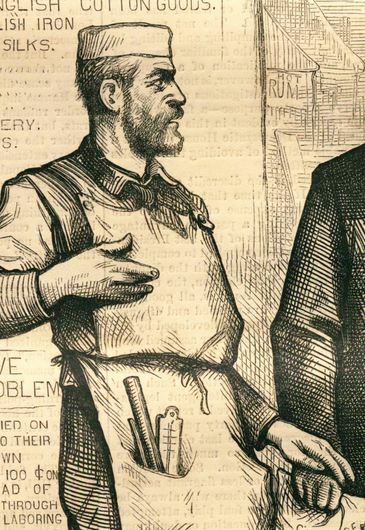 In the late nineteenth century, the three-time presidential hopeful sought to make his second attempt in 1880 a shoe-in by pandering to a xenophobic and fearful population of Euro-centric Americans. 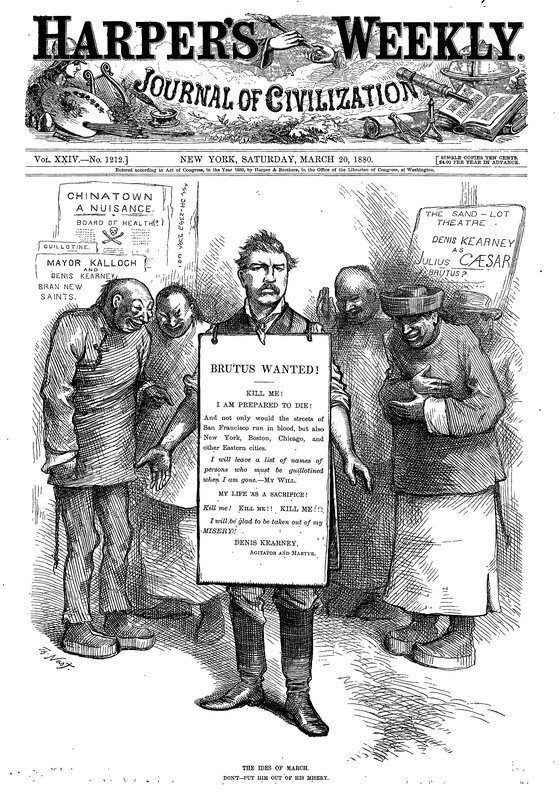 Blaine sought to abrogate a treaty protecting Chinese immigration. Needing the support of white labor in the west in order to achieve his presidential aspirations, Blaine encouraged their chants of “The Chinese Must Go!” and promised support of their demands. 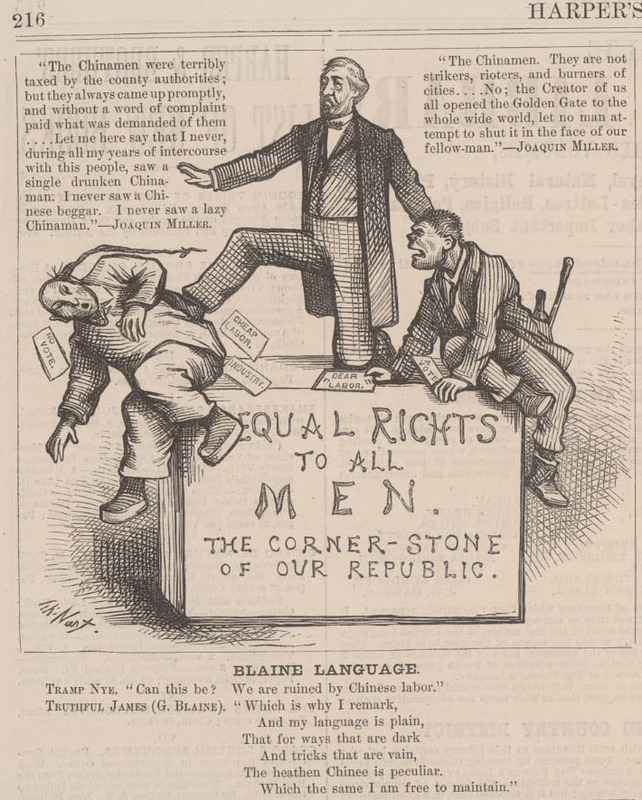 As an 1880 Republican presidential hopeful James G. Blaine called for the official federal exclusion of Chinese entering the U.S. 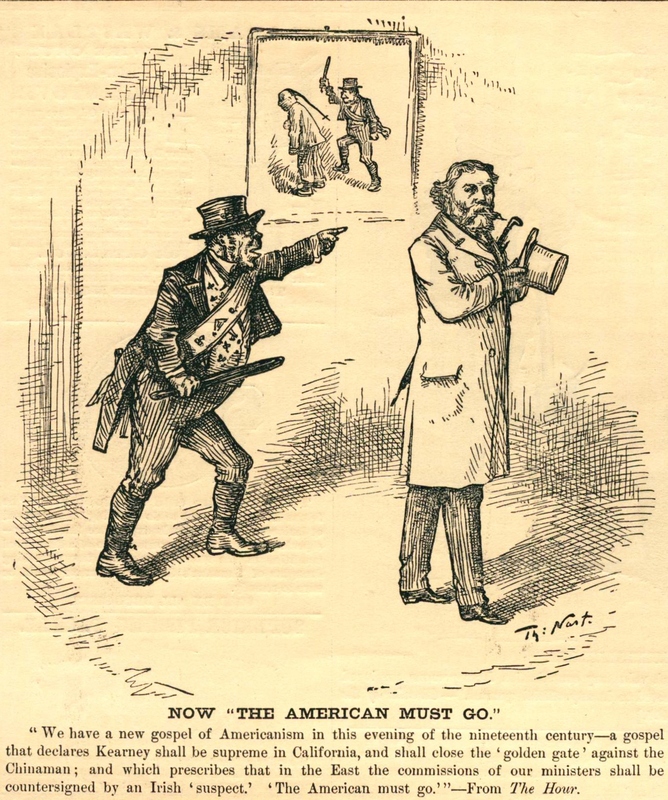 Fear mongering began soon after the Chinese arrived the United States. America offered hope to immigrants from the Far East. Lured to America with tales of gold nuggets, the Chinese were early arrivals during the Gold Rush. Like the Irish flooding into the East coast, the Chinese sought relief from the famine plaguing their homeland. 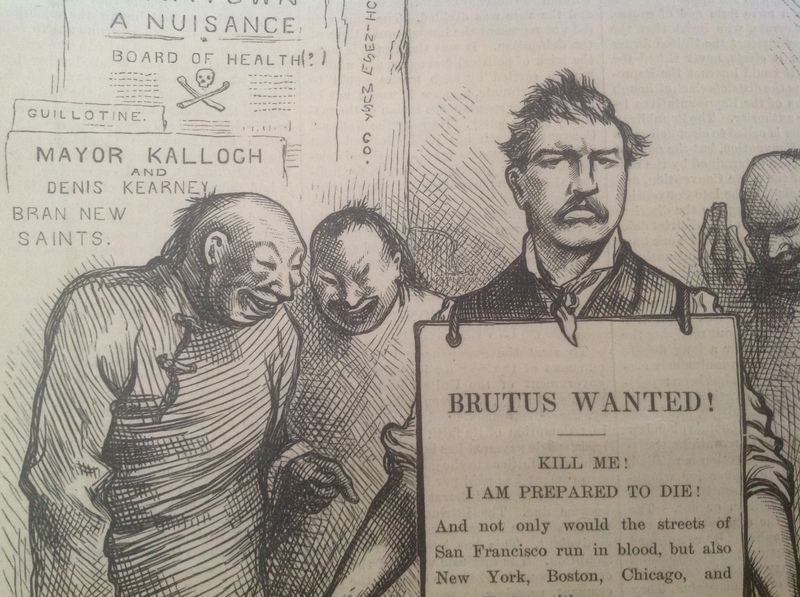 And while suspicions percolated about the Irish on the East Coast, by the 1870s Sinophobia reached fever pitch on the other side of America. Blaine took notice. 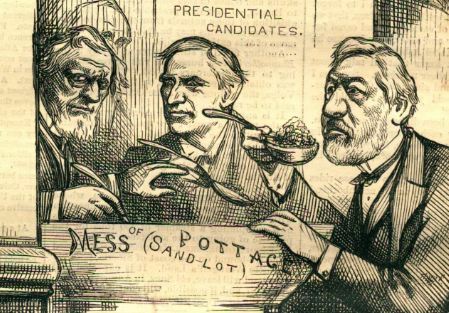 Readying for another attempt at the presidency, Blaine saw political advantage in aligning alongside a new, burgeoning and fearful electorate. In doing so, Blaine broke with his Republican Party’s tolerant position on accepting the Chinese. Nast found the defection unforgivable. 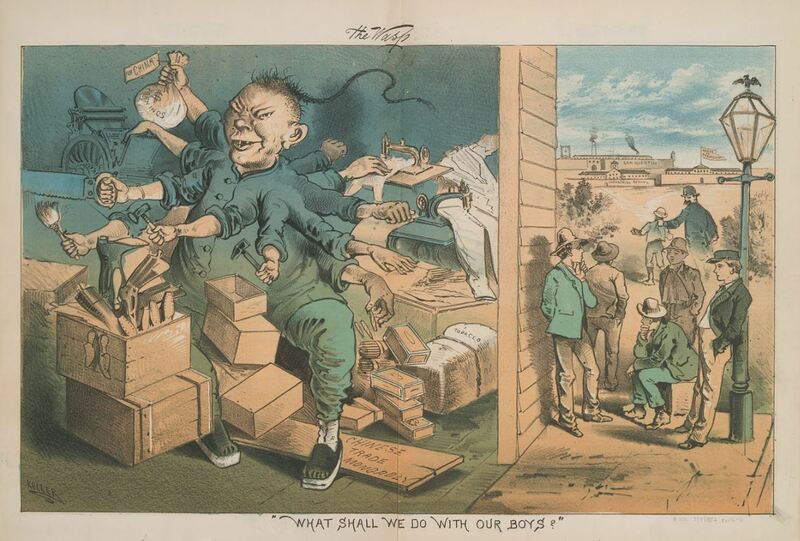 In the late nineteenth century, the Chinese in America, as a whole, were viewed as a critical threat to the health, welfare, and security of the United States. Derided for their non-Christian (heathen) ways, the Chinese represented a multi-level threat. 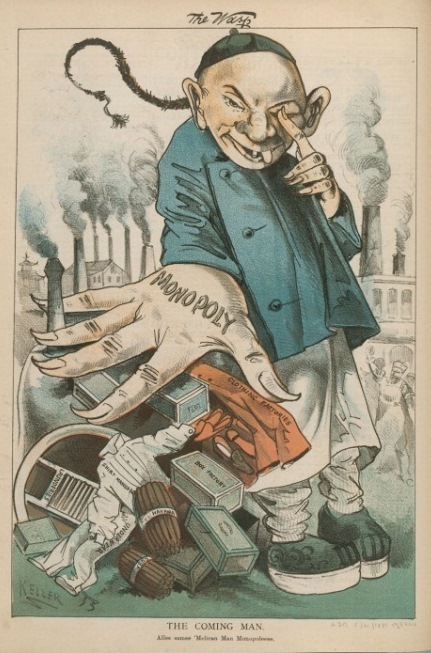 Popular rhetoric, steeped in propaganda, flourished. To white workers, citizens and immigrants alike, a life and death line needed to be drawn! Was there any doubt that the rat-eating Chinese would, and had already, spread life-threatening disease and pestilence among innocent Americans? Despite their modest immigration numbers, statistically low compared to other immigrants, the Chinese were nevertheless depicted in commentary and illustrations as invading hordes of less-than-human creatures who would forever alter and undermine a wholesome national identity and culture. The pro-business and progressive Republican Party during this era encouraged the Chinese to come to the U.S. Manufacturing and industry, particularly railroad executives, who valued the Chinese work ethic and used their eagerness to work as strike breakers. 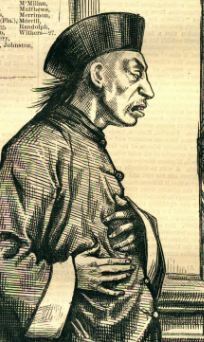 Despite their strangeness, the Chinese were earnest workers and helped tip many businesses balance sheets to the black. This financial reality bolstered the Republican-led, East Coast ruling elite’s tolerant position toward the Chinese. At the very least, having the Chinese in the U.S. made good business sense. The Democratic Party thought differently. 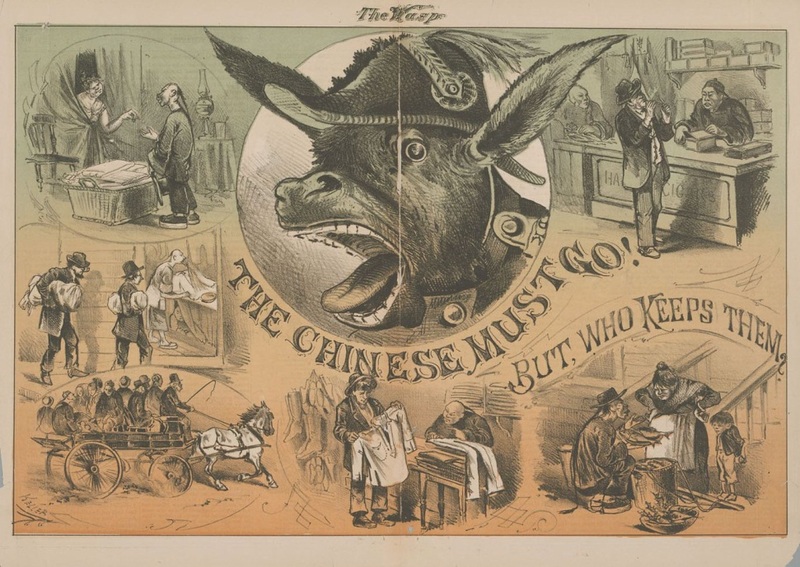 Echoing the fears of its burgeoning white and Irish labor base, Democrats sought to restrict the Chinese from arriving and wanted the ones already in the U.S. to go. Starting on the West Coast with local laws, talk of national laws excluding the Chinese in the U.S. steady gained acceptance during the 1870s. 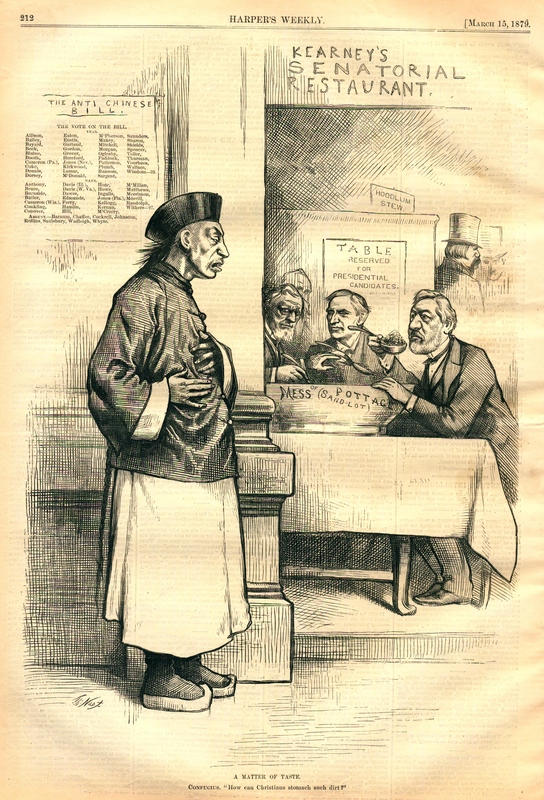 By 1879, the early drafts of the federal Chinese Exclusion Act had been entered into legislation and although vetoed, marked the beginning of the end for Chinese immigration. The writing was on the wall. Blaine saw where the future votes were. He needed the western vote to win his White House bid. 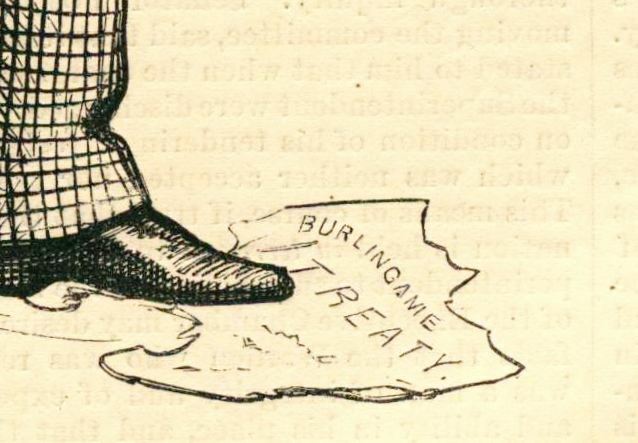 Blaine called for an end to the Burlingame Treaty, a treaty his Republican party had crafted. 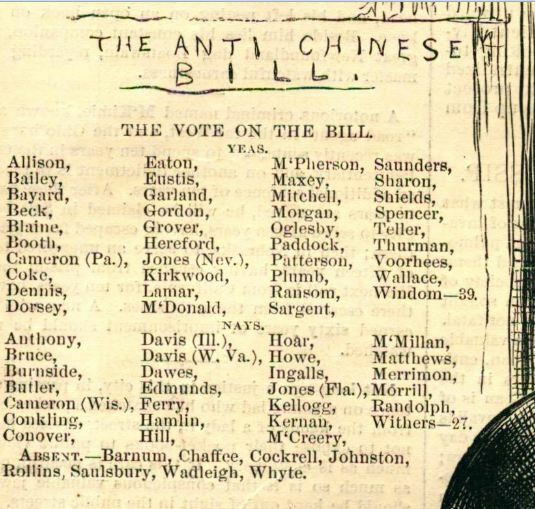 Blaine renewed the process to officially ban Chinese immigrants – legislation that made life miserable for the Chinese already in the country legally. Fully aware of Nast’s role in Tweed’s downfall, Blaine appealed to the artist and his editor, George Curtis, to cease producing the cartoons. Nast’s pen would not be silenced. 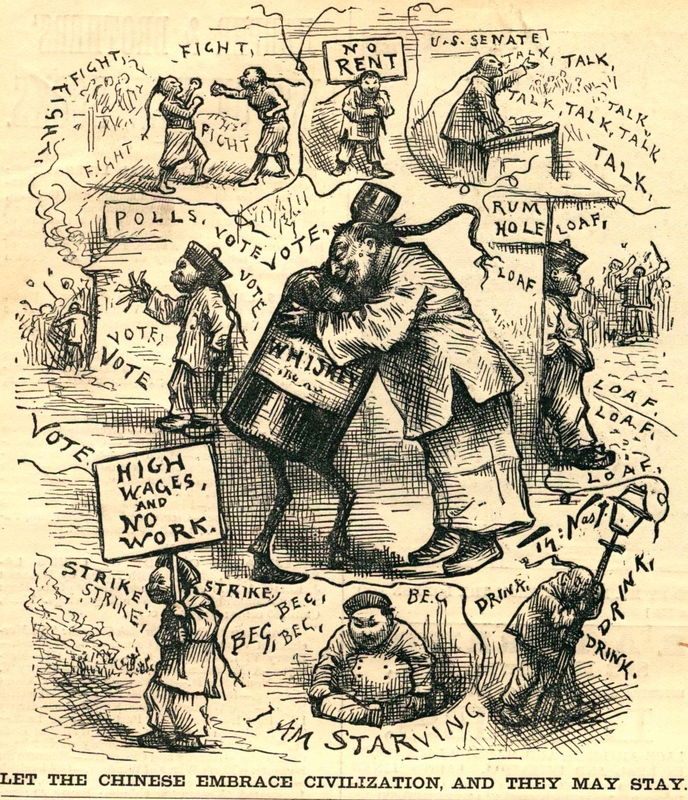 His cartoons are considered to have played a significant role in Blaine’s unsuccessful presidential bids in 1876, 1880 and 1884. Blaine’s last attempt went as far as earning the Republican nomination. 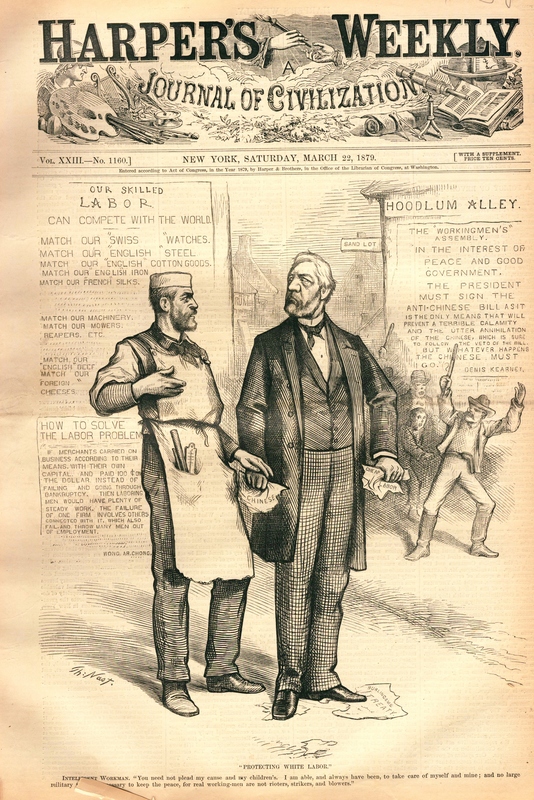 Blaine’s 1884 campaign, two years after the passage of the Chinese Exclusion Act, propelled both Nast and Harper’s Weekly General Editor George W. Curtis, to endorse the Democratic candidate Grover Cleveland officially on the pages of the venerated, Republican Harper’s. 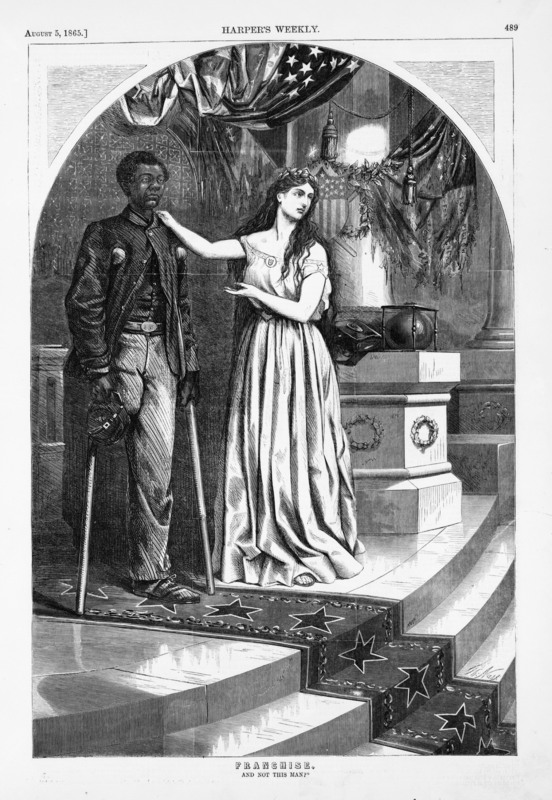 It was a startling departure for Nast’s and his beloved Party of Lincoln. 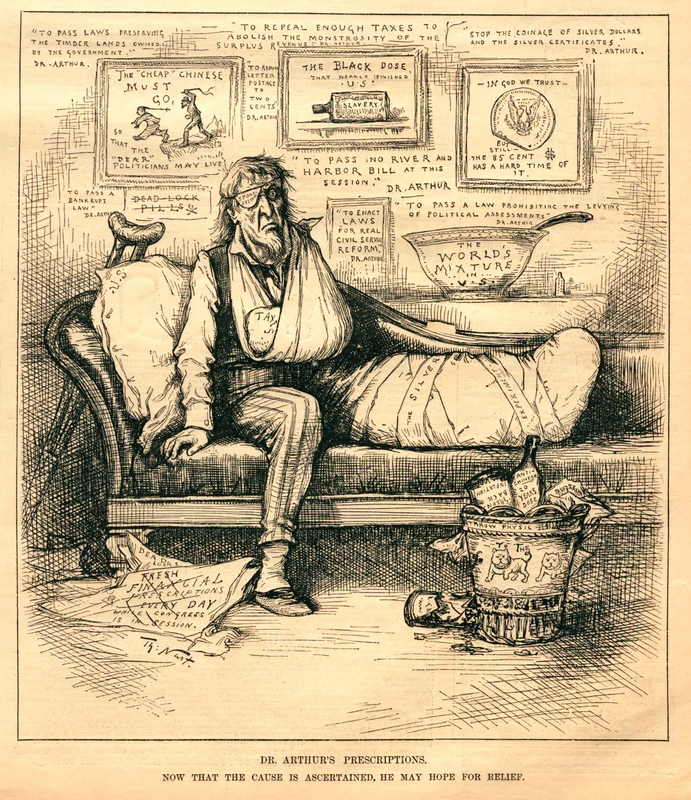 Although it is widely believed that Nast’s excoriation of Blaine cost the politician the presidency, Nast’s move to the Democratic side, albeit on moral grounds, significantly contributed to the cartoonist’s loss of favor with his Republican base and marked the start of his downward trajectory at Harper’s Weekly. Nast could not remain faithful to his party. As we all know, Blaine did not become president. Blaine lost his battles, but the war against the Chinese was won. 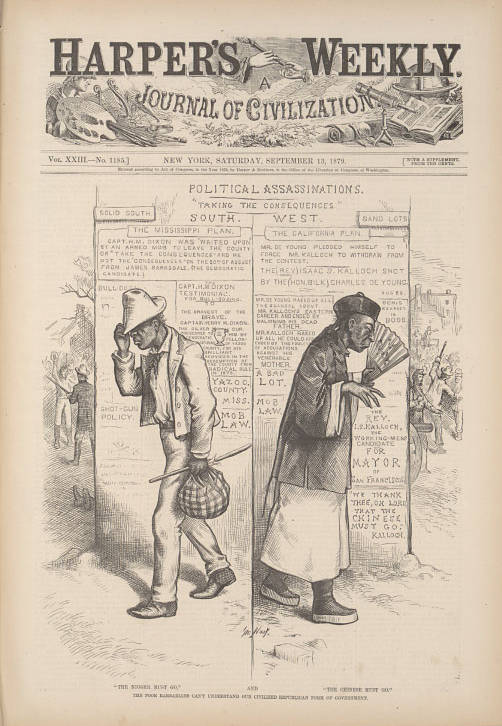 Enacted in 1882, the Chinese Exclusion Act became the first federal legislation to ban, outright, a population of people, based solely on ethnicity. 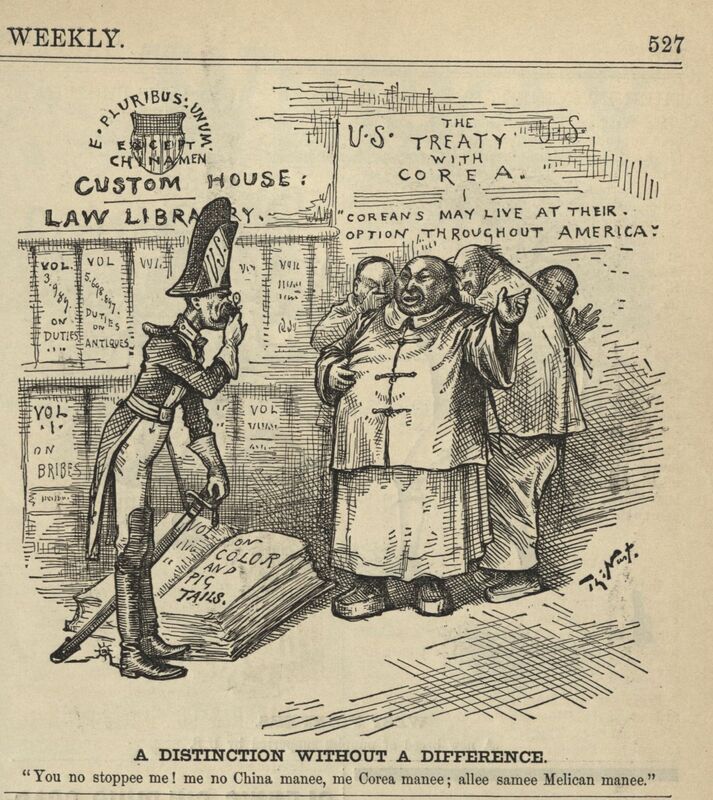 Those Chinese already in the United States were prevented from many of the rights extended to other immigrants. They could not return to their homeland for visits, as their re-entry would be barred. For the 61 years that the Exclusion Act sat on the books, it effectively and permanently separated Chinese men from their families at home. 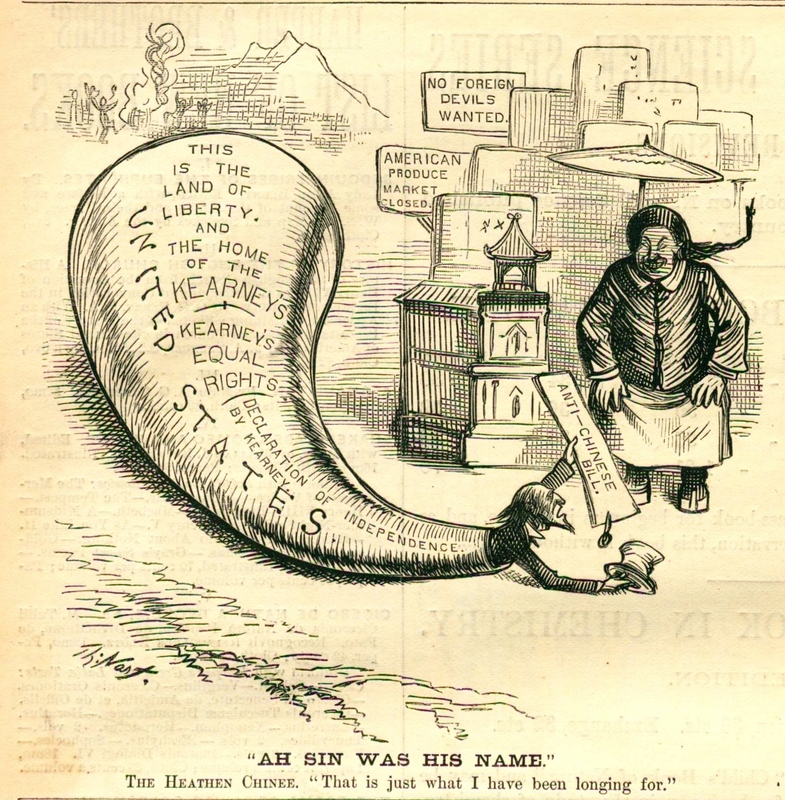 The Chinese Exclusion Act was repealed in 1943, and only as a response to the Chinese – American alliance during World War II. 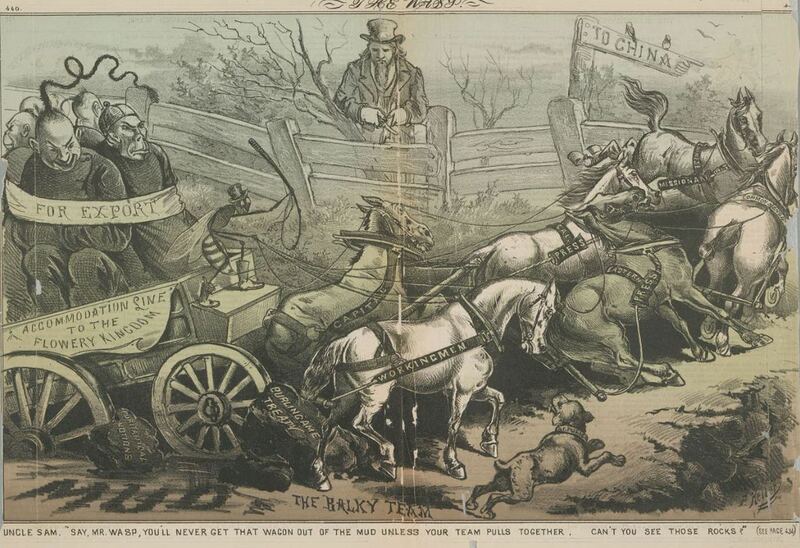 “More Protection in a Free Country” 9 September, 1882 by Thomas Nast. 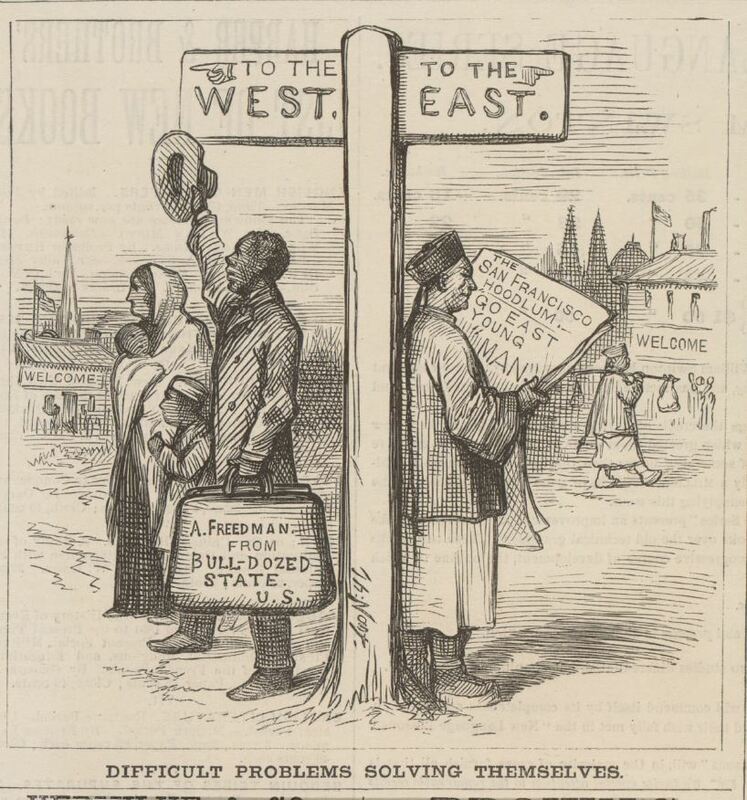 On the eve of the Chinese Exclusion Act’s passage, Nast drew this smaller cartoon, clearly illustrating the hypocrisy and irony of one immigrant, an Irishman, commenting that another immigrant, the Chinese, must go. The dapper clothes of the Irishman do not erase the crudeness of his face. Not simply “brutish” Nast draws the speaker as a fully formed ape. Nast reminds readers that this man is an “adopted citizen” and while his station as an immigrant has advanced to that of a business owner, he has risen to a place where he is more than willing to pay the price to get rid of the Chinese. The Irishman is more than pleased to pass off the Chinese problem to the British. Because of this unreasonable, hypocritical prejudice, Nast points out, that the UK’s John Bull and not Uncle Sam will benefit from the economical benefit derived from Chinese labor. The Irishman’s pose is unique and suggests delight — a playful confidence. His knees are bent and pursed together, set to leap or dance. His right arm is extended and holds a baton. 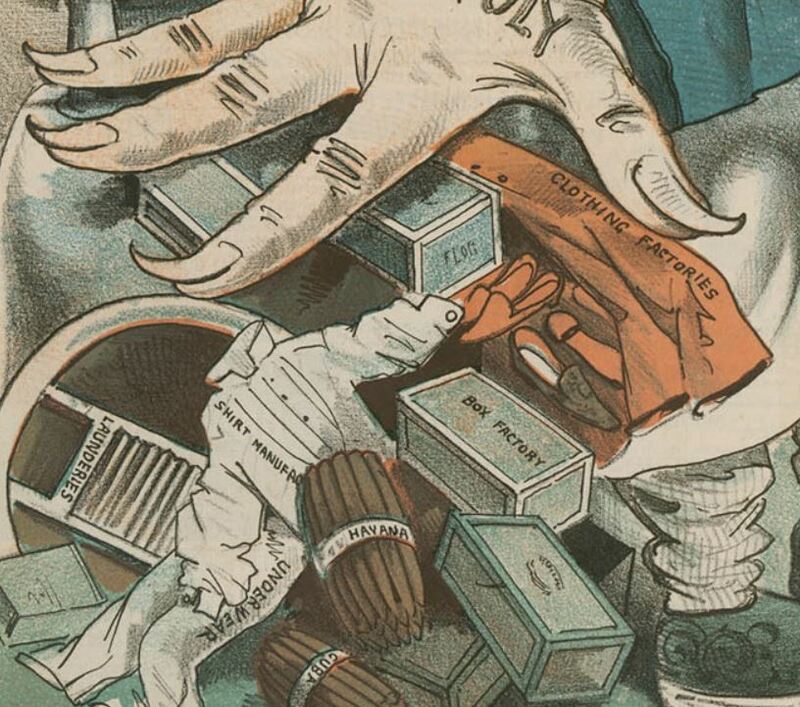 The left hand lands on the shoulder of Uncle Sam, implies he possesses the power of familiarity. Nast draws Uncle Sam as a lanky and stern American Eagle. His gaze is steely and down turned. This Uncle Sam is not fatherly. He displays no joy. With his hands folded behind his back, a position they would be in if his hands were tied. He is deep in thought, but it is unclear how he feels about the Irishman or this turn of event. America’s wealth, shown as bags of gold are leaving the country along with the Chinese. That England is now the sanctuary for the oppressed must rankle.